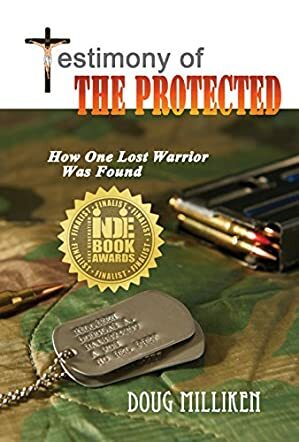 Testimony of The Protected: How One Lost Warrior Was Found is a non-fiction military memoir written by Doug Milliken. Milliken’s college deferment did not protect him from the Maine draft board’s notice. After the disastrous Tet Offensive, the draft boards were scrambling to provide the military with replacement soldiers to make up for the staggering losses maintained in that campaign. The author decided to enlist instead, thinking that perhaps he might be able to choose his Military Occupation Specialty and get a posting to Germany as a clerk by doing so. While the army made no promises, indications seemed hopeful at first that he would at least be assigned a desk job, but that was not to be the case. He became one of the infantry recruits who were sent on after Basic Training to NCO training to help the army cope with the need for Infantry Squad Leaders, a title few wanted or, for that matter, survived. Milliken arrived in Vietnam during the Christmas season and served his nearly year-long tour while planning to take advantage of the Army’s college early release program. He enrolled in college and had his father take care of the paperwork as he’d be returning to the states just in time for the fall semester. Doug Milliken’s non-fiction military memoir, Testimony of The Protected: How One Lost Warrior Was Found, is a gripping and well-written account of the author’s time spent in Vietnam and his subsequent conversion to Christianity. His story is honest and told in a wry, conversational style, and it’s accompanied by a most impressive collection of photographs taken in the country. Milliken goes beyond his own particular experiences and gives the reader an historian’s take on the politics and military strategy behind the incursion into Cambodia, which was to be a large part of his experience during the Vietnam War. He takes the reader into the jungle with him and his fellow soldiers as they recon the areas and set up ambushes, and eloquently describes the feelings of exposure and vulnerability the Recon Troop he was assigned to had to live with as their everyday experience. Milliken’s story segues into his life after service, beginning with his immediate enrollment in the university’s engineering program that he had always dreamed of, and the resumption of the kart racing he had loved since he was a teen. His conversion to Christianity is movingly and eloquently shared as is his dedication to the red-lined passages in the Bible that are the actual utterances of Jesus Christ. Looking through Milliken’s glossary of military terms is a must for civilian readers, and his bibliography is rich in resources for those looking to continue their readings on the Cambodian incursion. Testimony of The Protected is highly recommended.